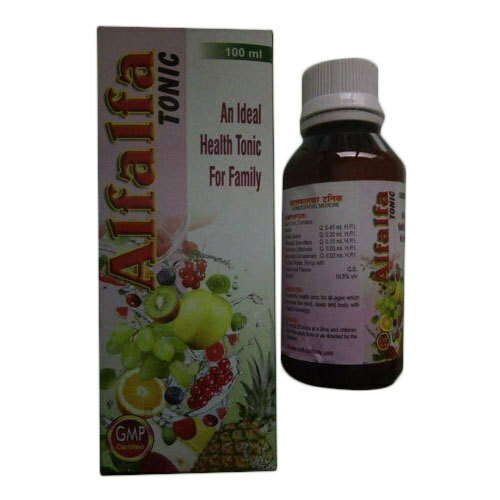 Supported ourselves with proficient amenities, we are readily instrumental in providing an inclusive variety of 100 ml Homeopathic Alfalfa Tonic.Other DetailsStrong Stimulative Tonic For Family. Supported ourselves with proficient amenities, we are readily instrumental in providing an inclusive variety of 100 ml Homeopathic Alfalfa Tonic. Strong Stimulative Tonic For Family. New Hindustan Homeopathic Laboratory is one of the renowned manufacturers of a wide range of Homeopathic Medicines, 15 Ml Rubina Pseudo Homeopathic Medicine, Homeopathic Syrups and Antacidron Digestive Syrup. These products are manufactured in line with the standards of the industry. The entire range of products offered by us is very popular in the markets for their afford ability and reliability.